I don't know why I say "we". It's just little ol' me. Regardless, I have finally moved to my own domain! I've had it for years, just gathering dust but it's now finally live! I will leave this blog up for a while but will not be posting here any longer. Come on over to the new home of Home Deconomics! Have you heard of Transition US? It's an amazing grass roots organization helping communities find and create ways to lessen their dependency on petroleum. And it takes many, many shapes and forms, big and small, public and private, from re-skilling fairs to bike tuning workshops to city wide solar installations. I'll bet you anything there is an already formed group near you! I had been wanting to connect with others who were in the same place as me, as far as improving our lifestyle, and knew our town was full of these folks. But how to find them? Then someone told me about Transition and that we had a local chapter. Oh joy! I have just begun getting involved with our chapter (Transition Fidalgo and Friends) and am very excited to have them team up with our Farmers' Market (where I am a vendor/volunteer) and present workshops all season! I am also taking part in the Transition Challenge! "Join the thousands of people taking the Transition Challenge this May. There are any number of actions you can take to improve the place where you live while at the same time showing support for local businesses & efforts, educating & raising awareness, building community and empowering youth. Pick up your shovels and tools. Help construct rainwater harvesting systems. Install solar panels. Make energy efficiency improvements, and share garden know-how with their friends and neighbors. Have a potluck! This is an opportunity to promote and increase participation in city and county programs for lawn removal, greywater and healthy food while creating innovative demonstration gardens in communities ranging from front yards to apartment patios, city landscapes, schools, churches, organizations and businesses." We are putting in a rain barrel system and planting for fruit! You can even see our initiative under "Growing Paynes" on the map in NW WA. Join us! Do something small or dream up something big! Share it with everyone and watch how everyone progresses! Are you already part of a Transition group? Tell us where! Did you take the plunge and register a project? Please share it! Let's do something really swell, shall we? Here they are as I picked out the trims. I haven't seen the table underneath in a week! I may be listing some of these on Etsy but most of them are destined for Farm Chicks. You just may have to go to Spokane to get one! As I mentioned in my last post, I love oilcloth but am afraid I am going to discontinue using it. I just have too many issues with plastic guys! I will use up what's left of my inventory and then it will be no more :( But have no fear, there are many super awesome shops on Etsy who will continue to supply you all with their super awesome oilcloth goods! I've just made a decision. I've just stepped over the line between acceptance to action. Now this is no major event or anything, in fact it's quite a small step but a huge shift in my thinking. To live a sustainable, self-sufficient lifestyle. This may be a let down or boring to some of you but it marks a significant moment in our household and I want to document our steps. I mentioned it here briefly but this is another, bigger step. I often watch documentaries to entertain myself while I'm cutting and sewing my goods for sale. My favorites are social and political commentary, especially involving our food system. I was watching one last week (not a very good one but poignant nonetheless) when someone made the observation that the public is going through the equivalent of the stages of grief (denial, anger, bargaining, depression, acceptance) in relation to our environment and added one more step. Action. For many years I was stuck in the depression mode, feeling helpless against the mega-corps and corrupt government agencies. How can we, the little guy, fight against that? I kept learning more, read a lot of books and watched way too many documentaries, talked with family and local community groups and entered the acceptance stage. Knowing and understanding how I can make a change but not yet walking the walk. After all, it's no small step for an average consumption-based household to suddenly make a big change. We talked a lot about what we'd like to do but never really followed through. But some where, suddenly I mentally crossed that line into action. ( I mean really sudden, like an epiphany while doing the dishes.) I'm ready. It's time. My mind raced for days, to the point I actually gave myself an anxiety attack. Were we ready for this? And there was the crux of the matter. We. Not just me. So the hubby and I sat down over a nice (local, organic and seasonal) lunch and talked about it. He's on board! There wasn't the same Jesus-ray-of-light-through-the-clouds-moment as mine but he's on board. So here we are. How to the two of us, the little guys, fight against that broken system? Well, you don't. You simply remove yourself from that system. I found that by taking what I call a self-centered approach, I am able to feel more productive and like I'm making a difference. Don't save the world. Save yourself. Worried about GM'd food? Grow your own (with heirloom seeds of course). Worried about the state of the economy? Get out of debt, not by earning more, but by consuming/buying less. What if the "grid" goes down? Have alternatives ready. What I didn't expect was to feel so empowered and secure. Knowing you can take care of your family on your own, without "outside" help is very empowering. It removes any remaining feeling of denial, anger and depression. That's why I'm writing all this down. It hit me like a bolt out of the blue. I am not religious but I have been joking that this is my religion now. I am a born-again tree hugger, a newly devout self-sufficiency disciple! There are many of you out there who have always lived this way. Quietly, without bragging or lecturing, you just Do. That is my goal. And I hope to document some of that here. Not for you, but for me (there's that self-centered bit again). This is our starting point. I want to note our beginnings so we can look back later and compare. We're pretty average, really. We own 2 cars and my husband travels a lot for work. I don't drive much but do drive downtown everytime i need to run errands in our small town. While we endeavor to eat healthful meals both at home and out, we happily slip up once in a while and get a greasy burger or gooey nachos. We eat mainly meat-centric meals but try to buy organic whenever possible. We don't get sick, don't have any nasty vices and consider ourselves "healthy" but we don't exercise and are pretty soft and sedentary. I am a very novice, intermittent gardener. I get lots of help and advice from others. I have a newly enlarged garden space that I am just getting ready to plant. I try to keep spending under modest control but I don't keep a budget and we use our credit cards too much. We have the usual debt a lot of Americans have (credit cards, car payments, student loans etc). I have dusted off my husband's bicycle and have begun to ride it downtown for my errands. More for my health than for saving gas (but at the rate gas is going up, why not save?). I have fantasized about getting a cargo bike! I want to grow and preserve as much of our own food as possible. Organically and from heirloom seed. I want to learn to save seed as well. I have seeds, the space, canning and dehydrating supplies. Time to put them to use! I must learn about winter crops. We are looking in to solar and even possible wind power options. By being more self-sufficient I hope to spend less and reduce our debt. I also want to just buy less. Who needs all this stuff? We have way too much junk and I am already purging our home of it. I have realized that the clutter in the home has been cluttering my mind as well. Junk be gone! So there we are. I had to get that off my chest. I thought about just journaling for myself but a small part of me wanted to share in case there are others in the same place as me. Indeed, please share your experiences in making change. Spring in Western Washington is a very fickle thing. She'll tease you early on with some nice warm days so you can mow your lawn and get some yard work done. A few more nice days and you think "Wow, this is going to be a warm spring!" and you decide to plant some seeds because you just can't wait any longer. Then Spring gives an evil laugh and sends in either snow and freezing temps or a torrential downpour and gale-force winds. So I must content myself with organizing and re-organizing my seeds (my orders arrived weeks ago) and longingly gazing at their full grown images on the package. Then I work and rework my garden plan. Erasing, moving and replotting where every seed and start will go. I've worn holes in the paper (companion planting revision!). I'm even dreaming of how I can further expand my garden, which I had just ripped out and completely reworked in the fall. The virgin beds are not yet planted (ok, that's a lie. I couldn't help it.) and I'm already trying to dig out more lawn to make room for berries and maybe some espalliered fruit trees. Then I think "don't go out, go up!" 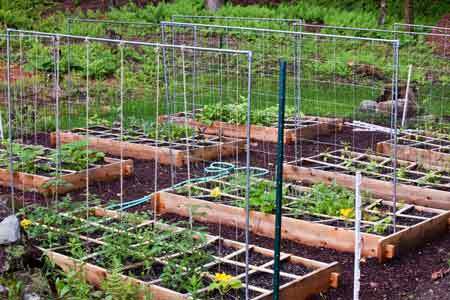 and start dreaming up giant towers for my beans and peas, or perhaps stringing wires all the way over to the fence to create a living arbor for the trailing nasturtiums. And let's not forget that cukes and squash can be grown vertically as well. This may or may not be a better use of my time but I sure have fun killing time on a stormy day by browsing books and websites for awesome garden ideas. How about you? Have you been an impatient gardener and planted too early (remember Feb '11 and those 80 degree days?) or are you the opposite and don't think of planting until summer is in full swing? This is a Flickr badge showing public photos and videos from Be the HBIC. Make your own badge here.